The influence of post-deposition annealing (PDA) ambient [O2, Ar, forming gas (FG; 95% N2–5% H2), and N2] on chemical, structural, and electrical properties of RF magnetron sputtered Y2O3 films on gallium nitride (GaN) had been investigated. X-ray photoelectron spectroscopy revealed that the bulk oxide annealed in different ambient was composed of Y–O and Y–N bonds while the interfacial layer (IL) was comprised of a mixture of Ga–O, Y–O, Ga–O–N, and Y–N bonding. It was also detected that oxygen trapping happened in the bulk oxide for all of the investigated samples but this oxygen trapping ensued until the region of IL for sample annealed in O2 ambient. The Y2O3 film subjected to PDA in N2 ambient was in amorphous structure as no Y2O3 phase was able to detect by X-ray diffraction (XRD). When PDA was performed in O2, Ar, and FG ambient, polycrystalline phase of Y2O3 was detected. Besides, XRD results also revealed β-Ga2O3 phase for all samples. A correlation between the chemical and structural results with metal–oxide–semiconductor (MOS) characteristics of Y2O3/GaN structure subjected to different PDA ambient has been established. Of these investigated samples, sample annealed in O2 ambient possessed the lowest leakage current and the highest electric field (∼6.6 MV/cm) at 10−6 A/cm2 due to the attainment of the lowest interface trap density, total interface trap density, and slow trap density as well as the presence of positive effective oxide charge. • XPS revealed that the bulk oxide is composed of Y–O and Y–N bonds. • nterfacial layer is comprised of a mixture of Ga–O, Y–O, Ga–O–N, and Y–N bonding. • O2 trapping happened in bulk oxide and interfacial layer for O2 annealed sample. • O2 annealed sample sustained the highest electric field of 6.6 MV/cm at 10−6 A/cm2. • Correlation between chemical, structural, and MOS characteristics of Y2O3 gate. Fig. 1. 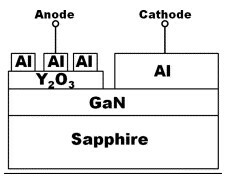 A schematic diagram of Al/Y2O3/GaN MOS test structure.